In this post, we will explore how to integrate the Audit Trail plugin with CloudBees Jenkins Analytics to provide a centralized audit dashboard of audit activity. 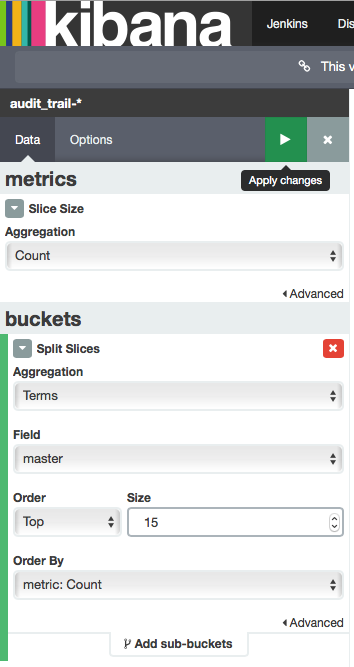 Analytics is an important feature of the CloudBees Jenkins Platform. 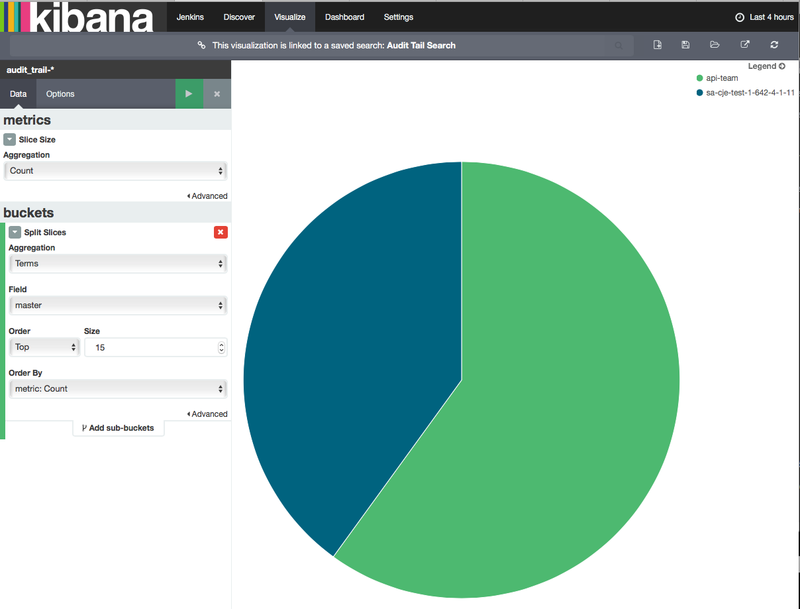 Elasticsearch is used to index build and performance data of CloudBees Jenkins Enterprise masters that are connected to CloudBees Jenkins Operations Center (and optionally index data from CloudBees Jenkins Operations Center as well), and display that information via a set of built-in Kibana dashboards. However, your are not limited to the provided dashboards and may modify them or create completely new dashboards. 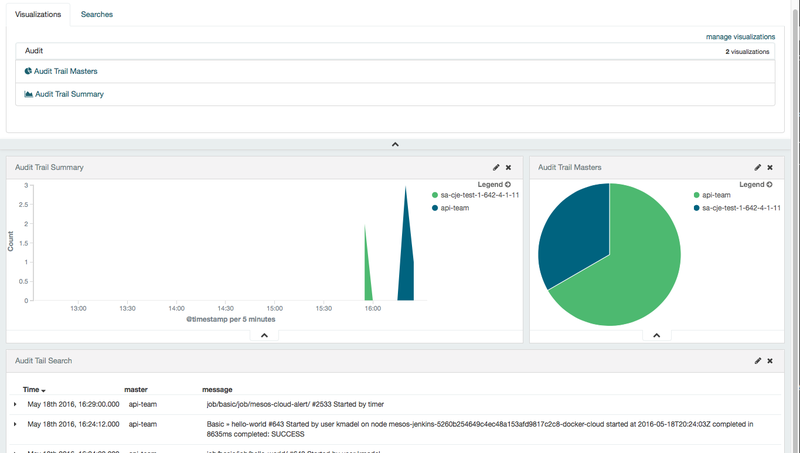 Kibana is exposed via the CloudBees Jenkins Operations Center Analytics Dashboard Creator link, allowing you to customize existing dashboards or create new ones. In this post, I will walk you through the process of creating a custom Kibana dashboard for a very specific use case: a Jenkins Audit Trail dashboard. Tracking changes is an important part of most enterprise organizations, whether it is for legal compliance, enterprise policies, other standards, all of the above or something else entirely. In the IT space, this type of tracking is often referred to as audit logging or an audit trail. Valentina Armenise explored audit logging strategies for Jenkins over a year ago. 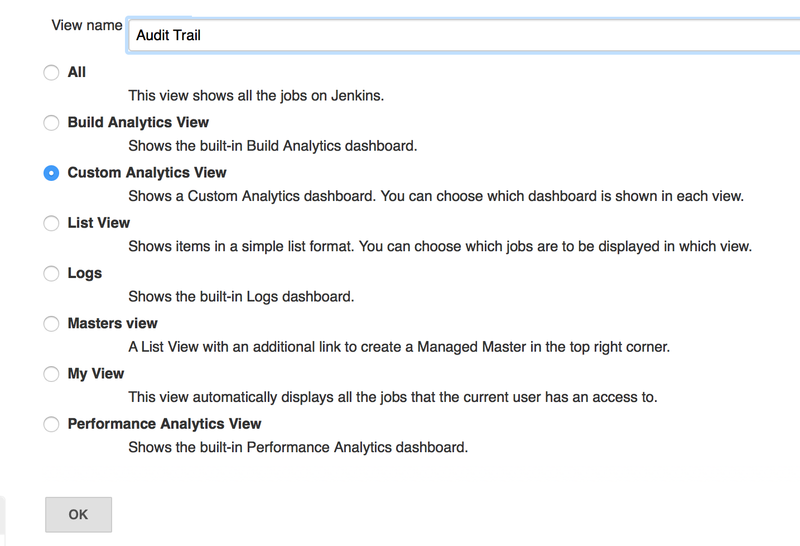 In this post, we will explore how to integrate one of the plugins mentioned in Valentina’s post, the Audit Trail plugin, with CloudBees Jenkins Analytics to provide a centralized audit dashboard of audit activity across multiple CloudBees Jenkins Enterprise masters connected to the CloudBees Jenkins Operations Center. In order to view data in a CloudBees Jenkins Analytics dashboard, it has to be available in the Elasticsearch index configured to be used by CloudBees Jenkins Operations Center. However, we don’t want to pollute the existing build-* and metrics-* indexes with audit data, so we will create a new Elasticsearch index and we will see how this will make it much easier to create our custom Audit Trail dashboard. There are a number of ways to push data into Elasticsearch, but we are going to use Logstash because it is able to easily consume the Syslog format as input and because the Audit Trail plugin supports Syslog as one of its outputs. More specifically, the Audit Trail plugin supports the output of RFC 3164 compliant Syslog - making it very easy for Logstash to consume and manipulate. 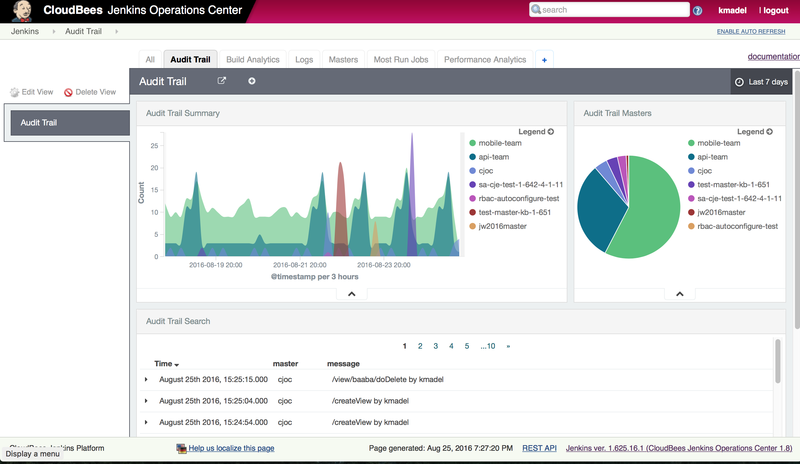 Also note that we are using the logstash mutate filter to rename the Syslog ‘program’ field to ‘master’ as we will use this field to capture the name of the Jenkins master where the audit activity occurred and renaming it will provide for more meaningful labels in the Kibana dashboard we will create. Once you have the Logstash container running and have set up the custom index template for the ‘master’ field, you are ready to install and configure the Audit Trail plugin in Jenkins. We have specified the Jenkins master name as the value of the ‘Syslog App Name’ field. Once this is saved, all auditable actions will be pushed to Elasticsearch via Logstash, the same Elasticsearch instance we have configured for CloudBees Jenkins Operations Center to use. Now that we have Audit Trail data flowing into a new custom index in Elasticsearch it is time to create a custom dashboard to display that data. We start by clicking on the Analytics Dashboard Creator link in CloudBees Jenkins Operations Center, bringing up the Kibana interface. NOTE: Before running through these instructions you will want to push some Audit Trail data from two or more masters to Elasticsearch in order to verify that everything is working - you can save a few job configurations and the Jenkins system config for example. After you have entered the pattern, click the Create button. Note: The trailing asterisk is very important because the audit data is being indexed daily and without it there will be no match. Non-wildcard index patterns require an exact match. Now that we have a custom search saved, we can create some visualizations based on it. 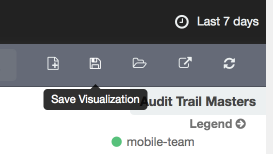 Save the visualization with a Title of Audit Trail Summary. Now click on the Save Dashboard button, name it Audit Trail, check the Store time with dashboard checkbox and click the Save button. In this post we explored how it is possible to create custom CloudBees Jenkins Analytic Dashboards with a completely new data source - in this case data from the Audit Trail plugin. You can apply these techniques to any data that you push into Elasticsearch and create your own custom CloudBees Jenkins Analytic Dashboards. Published at DZone with permission of Kurt Madel , DZone MVB. See the original article here.